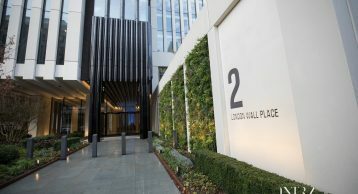 What is London Wall Place? 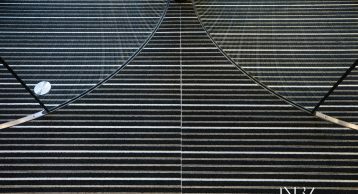 London Wall Place is an up and coming 500,000 sq ft development in the heart of London, one that will provide two flagship commercial buildings and almost an acre of landscaped public space. This new space when fully developed will create a unique destination for visitors, combining a series of new gardens set amongst historic monuments such as the Roman City Wall and St Alphage Church Tower ruins. 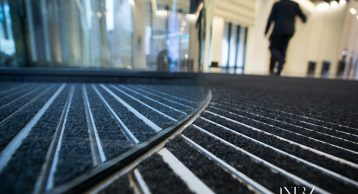 Find out how our Entrance Matting is playing an important role in the management of dirt and moisture into the building therefore maintaining the internal aesthetics of the building. 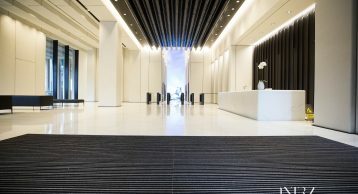 Management are set to develop two main buildings, 1 London Wall Place which is a 12-storey tower and 2 London Wall Place (completed); it’s twin which is a 16-storey tower. The striking feature of both these buildings is the cantilevering steel frame to extend onto the footpath adding a touch of class to these buildings. 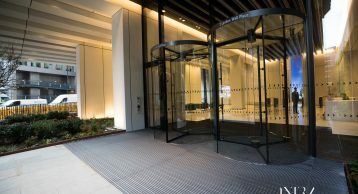 Such a high calibre building deserves to be kept in the best condition, and when it comes to making the best first impression, what better place to do this than at the entrance. However, if every entrant brings in dirt and moisture into the building the interior will not only get damaged but also look dirty. 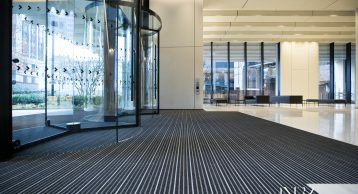 This is where INTRAsystems worked with the architects in specifying the innovative INTRAflow Entrance Matting solution to prevent the ingress of dirt and moisture into the building. 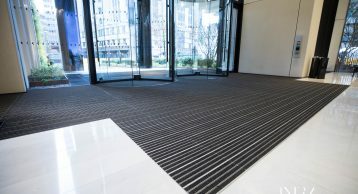 Our Entrance Matting installed in 2 London Wall Place is maintaining safety for the foot traffic that passes through the entrance on a daily basis, it is also helping maintain the aesthetics of the building as less dirt is trafficked in aided by the open construction of this Entrance Matting. As a result, maintaining the aesthetics of the building. 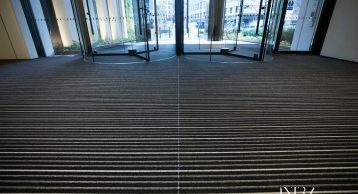 As our INTRAflow Entrance Matting forms a barrier against the ingress of foot borne dirt and moisture it also helps the management keep their cleaning costs to the minimum. 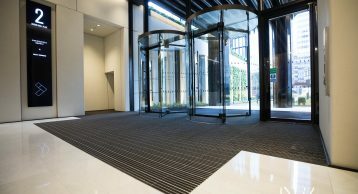 Entrance Matting is a small element in a big project, but we feel it’s one that has a big impact on the building when it comes to cleanliness, safety, sustainability, and client retention. Contact us today and see how we can help create a lasting impression for your entrances.